Hole in the Ground Contest! This is the opening line to the Hobbit. According to Wikipedia, it came to Tolkien while he was grading papers. Not only should this bring hope to teachers and grad students everywhere, it’s the first step on an epic journey that many of us have since taken, culminating in billions of dollars of motion pictures starring John Watson, Sherlock Holmes, Magneto, and Agent Smith, with Queen Elizabeth as Galadriel. Sauron, getting ready to party with the elves. 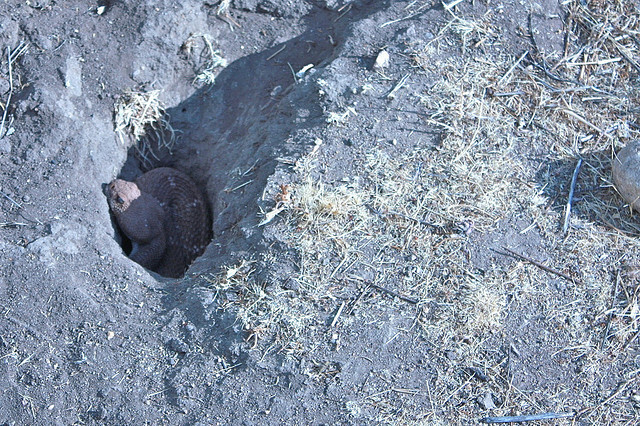 Not a nasty, dirty, wet hole, filled with the ends of worms and an oozy smell, nor yet a dry, bare, sandy hole with nothing in it to sit down on or to eat: it was a hobbit-hole, and that means comfort. It had a perfectly round door like a porthole, painted green, with a shiny yellow brass knob in the exact middle. The door opened on to a tube-shaped hall like a tunnel: a very comfortable tunnel without smoke, with panelled walls, and floors tiled and carpeted, provided with polished chairs, and lots and lots of pegs for hats and coats – the hobbit was fond of visitors. By paragraph three, we are introduced to the hobbit who is so fond of visitors, and by the fifth, to a particularly meddling, wizardly visitor. All of that from “In a hole in the ground there lived a hobbit.” But think of the other places you could go with this. Where would China Mieville have run with that opening sentence? Octavia Butler? Neil Gaiman? Karen Joy Fowler? Also lives in a hole in the ground. So, I have a challenge to you all: Come up with 3-5 sentences to follow “In a hole in the ground there lived a hobbit”, that take the story in a completely different direction, and post them in the comments below. There’s a prize in it for you–I’m going to ask my fellow inkpunks to help judge, and the winner will receive a kindle version of Fungi, not only because mushrooms also live in holes in the ground, but because our very own Andy Romine has a story in it! You have until 9pm Pacific Time on Sunday, December 16th to submit your entry. I’ll post the winning entry before the end of the world, or at least the end of the Mayan calendar. Good luck! Fungi anthology: not just for fun guys. In a hole in the ground there lived a hobbit. Not a nasty dirty hole, although slightly messy, it was filled with the glorious tubes and boiling pots that would remind a nostalgic soul of a heroine lab. The hobbit was an experimental fellow with a taste for fine potions and odd synthetics, so after consuming a strange and clouded chemical the hobbit proceeded to lacerate his stomach and sup on his intestines. When a troop of dwarfs arrived at the hobbits homestead, they found the deflating husk of the once cheerful hobbit, guts spreading across the floor. Quickly burying him the garden, from his rotting corpse, grotesque spiders laid eggs that raised an army of deformed plant warriors. Little is known of what happened next, all was found was the mutilated corpse of a wizard. Sorry, I posted it twice accidently. It won’t let me delete it though. The hobbit was an experimental fellow with a taste for fine potions and odd synthetics, so after consuming a strange and clouded chemical the hobbit proceeded to lacerate his stomach and sup on his intestines. When a troop of dwarfs arrived at the hobbits homestead, they found the deflating husk of the once cheerful hobbit, guts spreading across the floor. Quickly burying him in the garden, from his rotting corpse, grotesque spiders laid eggs that raised an army of deformed plant warriors. Little is known of what happened next, all that was found was the mutilated corpse of a wizard. survived on what others cast away. Furnished with the decaying remnants of a society that shunned him, it was the best he could do. Rough-cut tunnels ran off from the main chamber where he could go and take care of his own business or to hide from unexpected visitors. For now he contented himself with a moment’s rest sitting on a dilapidated couch upholstered in a pattern he would have never chosen. Through the narrow grate overhead he could just make out the faint light of the stars and wish they’d take him to the home where he belonged. In a hole in the ground there lived a hobbit. Our suspicions rose first in late autumn, when the floorboards in the kitchen groaned and quivered, upending the soup course and collapsing the soufflé. After that, James unearthed sheaves of molt from the soil–long green strips of shed flesh, like a jade dragon turned flaccid. Effie left that morning, swaddled the baby and fled for Colville on the late ferry. Dad took a shovel and a shotgun and told us all to stay inside. But by then we could see the hole from the front window–a yawning death-scented hobbit hole, like a mouthful of festering teeth gnawing at the porch’s edge. Not a large-type hob, like a hobnob or a hoblord, nor a huge as a mountain like a titan hob — such a hob might not fit into a hole in the ground. And certainly not a wicked delinquent like a hobgoblin, hobyah, or hobster, and not so small as a hobbin or hobgob, and not so kind as a hobyah. In this particular hole lived exactly one hobbit, exactly the size, shape, and temperament of herself, which she wasn’t very fond of. Because of that, she was about to change everything. In a hole in the ground there lived a hobbit with his friend. “Do you think we’ll ever have to release the rumbling dragon?” asked one. (A friend’s father did this, he said they’d drive a pickup off on a road to random point in South Dakota, park it, then take a trail to a camouflaged door in the ground. If I remember both were trained for the job, but there were definitely two because the one who did not answer the phone had the job of holding the gun to make sure the launch was executed, and use that gun if it was not). In a hole in the ground there lived a hobbit. The grumpy old hobbit reminisced about the days before dark skies. He missed his majestic treehouse especially on days when the light winds would rustle the leaves allowing the morning light to flicker into his bedroom. Now, even with no leaves left on the tree above his home in the ground, the only flicker of light is from a candle that stays lit day in and day out. As he prepares breakfast he is startled by a loud knock at his front door. At six feet under, the mass of the soil pressing down on him made it impossible to move; to breath, to squirm. He wanted more than anything to wipe the gritty earth from its eyes but he couldn’t move his stubby little hands to his face. The loamy smell clung in the back of his throat as the weight of the dirt pressed the air from his chest. Alone, in the dark, the little hobbit’s own heart beat was deafening in his ears. In a hole in the ground there lived a hobbit, but not for long. In a hole in the ground lived a hobbit. At least, it had once been a hobbit. The opening was dry and sandy, with nothing to sit down on or to eat. Further back it grew dirty and wet, gritty stones mixed with oozy-smelling earth. There was something to eat, if you didn’t mind worms and grubs that wriggled in your mouth before you bit down on them. The something that had once been a hobbit squatted in the sand at the hole’s entrance and picked bits of chitin out of its six remaining teeth. He wondered, for the thousandth time, how he had let that nasty, thieving wizard trick him out of his rights to the story of that one beautiful thing, his birthday present, his precious. And he wondered how far away New Zealand was. In a hole in the ground there lived a hobbit, although not by choice. 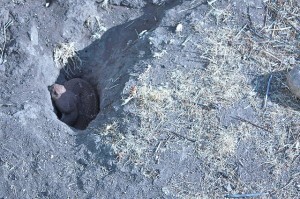 He had moved into the hole following the destruction of his house. The details of the destruction are nebulous, but seem to revolve around a visit from a traveling sorcerer. It turns out that sorcerers from the Utter South do not like tea and are not amused when told that there is no coffee to be found. The Hobbit had learned a valuable lesson. Never say no to a wizard. In a hole in the ground there lived a hobbit. Sharp fanged and bloodless, it would rise at night from the crypt that housed its body and feed. Around its dark abode were buried the villagers whose mangled corpses were placed, stone marked, and entombed with stakes piercing their quiet hearts to ensure that hobbits they too never became. For with large and bare feet the beast would creep, creep, creep through any cottage and find what beds they would and take what blooded thing they found there for its own dark nectar, be it infant, youngling, or aged-wrinkled sage. It was ever silent, and would leave as unnoticed as it came, for the two marks in the neck it left were hobbit-holes and ever placed by means covert. Thank you, everyone, for your entries! The Hole in the Ground contest is now closed! I’m amazed at the creativity and imagination that went into your writing. I’ll coordinate with the inkpunks to select a winner, and will announce the results by the end of this week! Apologies for the delay, folks, but we finally tallied votes, and it was really, really, really close between first and second place! Also, we’d like to note that Wendy Wagner abstained from voting because her brother was one of the entrants. Tied for third place are Tim and Luna Flesher Lindsey. Jak Wagner came in second, just behind our first place contestant. Honor and glory to all three of these wonderful writers! The winner is Sarah Grey! Sarah, congratulations! 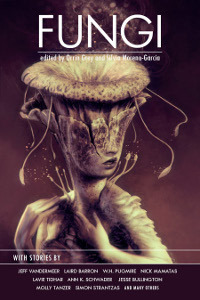 We’ll be contacting you via email so that we can send you an electronic version of the Fungi anthology. Thank you all for participating. You demonstrated the many directions that our creativity could take that one starting sentence. Sarah, I don’t have your email, so I initiated contact via twitter. Please DM @johnremy, or we can arrange some other communication method.